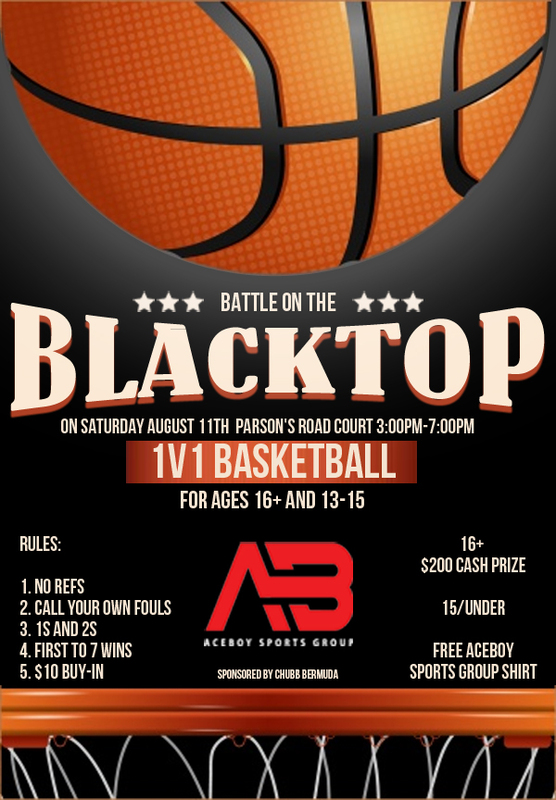 AceBoy Sports Group [ABSG] will host a 1 versus 1 ‘street ball’ basketball tournament dubbed “Battle on the Blacktop” on Saturday afternoon [Aug 11] on the outdoor court on Parson’s Road in Pembroke. A spokesperson said, “This tournament will be the official launch of the AceBoy Sports Group [ABSG], a local aspiring athlete representation firm with a mission to promote and represent promising Bermudian athletes across a variety of sports, and help them reach their athletic goals. “‘Battle on the Blacktop’ will be Bermuda’s first ever 1 versus 1 ‘street ball’ basketball tournament. The event will take place on the outdoor court on Parson’s Road in Pembroke, from 3:00pm-7:00pm on Saturday August 11th. “There are no referees in this tournament and players will be allowed to call their own fouls. The first to seven points wins and advances to the next round. “With this tournament being the official launch of ABSG, we hope to bring the local community in and around the Parson’s Road area together for a day of family, fun, and basketball! This will be an annual event, as we hope to grow and make this a staple event in Bermuda sporting and basketball culture. “Following this event will come various other events centered around other sports in Bermuda. Various AceBoy Athletes who we currently promote and work with will also be in attendance. 16 and over group is $200 cash prize and a trophy. Age 13-15 group is a free ABSG t-shirt. And of course ultimate bragging rights as Bermuda’s Top baller. “The buy-in price for players in both age groups is $10. Battle on the Blacktop’ is officially sponsored by Chubb Bermuda, who we are very grateful of in their support of the event. “There will be official ABSG t-shirts on sale at the event for $15. Admission to watch the tournament is free.